The Canadian Eskimo Dog (Canadian Inuit Dog) or Canadian Husky (Exquimaux Husky, Kingmik Dog) is an ancient Spitz type working dog that originated in the Arctic Circle. This is probably the oldest and most primitive of all Canadian indigenous dogs. The breed is believed to be more than 4.000 years old. It was first domesticated by the Thule people, a proto-Inuit tribe (the ancestors of all modern Inuit) that lived for centuries in the northern parts of Canada, Alaska and Greenland. According to certain historical evidence, the Thule had started to use these dogs sometime between 1100-1200 AD primarily as hunters assistants and guardians, but later on they began to use them for sled pulling as well. CED is closely related to the Greenland Dog, with whom it shares many similarities. In fact, these two breeds are often mistaken for each other, and they both have much in common with wolves. For a long time, the Canadian Husky was thought to be a tamed wolf or some close relative of the wolf. Even Charles Darwin, the famous naturalist and geologist, thought the same due to almost identical look and vocalisations. However, recent genetic study of this breed has proven that there are no significant traces of wolf genes in newer generations of Canadian Eskimo Dogs. The Canadian Eskimo Dog history has always been closely related to the Inuit people, among whom the breed is known under the name Qimmiq, which is their word for ‘Dog’. In some of the harshest and most inhospitable lands in the world, Inuit and their dogs shared their struggle for survival, helping each other to overcome many life obstacles. Unfortunately, Inuit always thought of their dogs simply as a tool for survival, not some devoted companions and helpers, so they were often treated rigorously and mercilessly. Yes, they normally used CEDs as working dogs for sled pulling, packing and hunting, but they also kept them as a source of food and fur (their fur is more durable and thicker than that of wolves), especially in times of famine. Not only the Inuit found these dogs extremely useful, but various explorers (Roald Amundsen and Robert Edwin Peary) of the Arctic and Antarctic from around the globe. In the first half of the 20th century, Canadian Huskies were so popular that their population was estimated at around 20.000 specimens. Unfortunately, their numbers had started to rapidly decline after 1960 with the introduction of snowmobiles, so that in 1970 there were less than 200 registered CEDs in the world. This was truly a dire situation and the breed was on the brink of extinction. 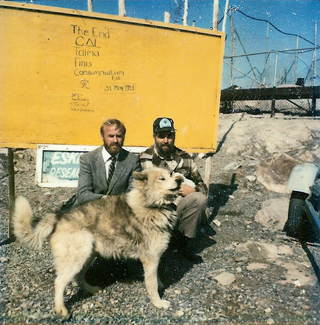 Since then, Brian Ladoon and the Canadian Eskimo Dog Research Foundation (CEDRF) from Yellowknife, which was founded in 1972 by John McGrath and William Carpenter with the financial support from the Canadian Government, the Northwest Territories Government and the CKC, have worked intensively to save the Canadian Eskimo Dog breed and to increase its numbers. They obtained purebred CEDs from Inuit camps on Boothia Peninsula, Melville Peninsula, and Baffin Island as well as from some other Inuit communities in the north of Canada. Thanks to the hard work of these wonderful men, the breed was luckily saved from the brink of extinction, but its numbers are still extremely low, with only around 300 registered dogs in the world. In recent years, the CED is at least regained its recognition as one of the Canada‘s oldest and most authentic breeds. It was even chosen in 2000 as the animal symbol of the Nunavut territory in Canada. 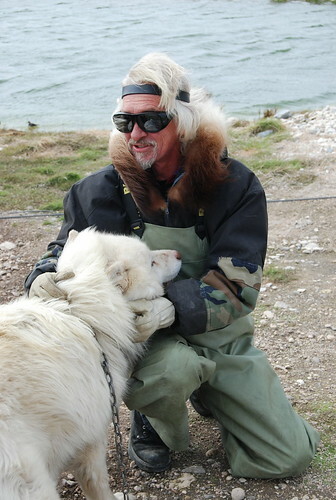 The Canadian Eskimo Dog is not recognized by the FCI, not even provisionally. The AKC had recognized the breed in the first half of the 20th century, but was later in 1959 dropped due to small numbers of registered dogs. The Qimmiq is still recognized by the CKC in the Working Dogs group as well as by the UKC in the Northern Breed group. The Canadian Eskimo Dog is an intelligent, loyal and sturdy dog best known after its incredible strength and hardiness. He is also very brave, powerful, resourceful, determined, tenacious, tough, curious, stubborn, and highly pack oriented. That’s why it is recommended that you buy at least two or more CEDs simultaneously or a CED with some other dog(s) – preferably male and female to avoid fighting for dominance. These dogs simply need company all the time, so if you are unable to dedicate as much time as possible to your Canadian Eskimo Dog, maybe it is better that you chose another breed. Even though the Qimmiq is first and foremost a versatile working dog that can be used for various jobs – sled pulling, packing, hunting, protection, he is nonetheless a gentle and affectionate family companion. Indeed, this is truly a dear and loving dog that will equally enjoy the company of all members of the household and will be quite devoted to the entire family. However, he will never be “blindly” obedient and eager to please each one of them unless he sees some benefit for himself. This privilege is only allowed to his primary owner. The Canadian Husky is a very pack oriented dog with a strong sense of hierarchy, and as such, he will always be completely submissive and loyal only to the head of a pack – the Alpha leader. Like some other sled dogs, such as the Siberian Husky, the Alaskan Malamute, or the Greenland Dog, the Canadian Eskimo Dog can be a good playmate for older children, especially if he is raised with them. However, the CED is definitely not recommended for families with toddlers or small children. The reason for that lies in the fact that this is a very primitive dog with great strength, huge energy and a very strong prey drive, which is often stimulated by natural survival instincts, much like every other wild canine. As such, every Canadian Inuit Dog will always fight for the highest position in the pack, for every piece of food, for everything that can make his life as comfortable as possible. So, if there is a small and, in his eyes, irrelevant child standing in his way, the CED will run over it without being too worried about the consequences. It is needless to say that this can end up pretty badly. That’s why it is absolutely mandatory that you teach your Canadian Eskimo Dog at an early age to respect your kids and treat them nicely. However, in some cases even that won’t be enough, so you will have to constantly observe your children while playing with a CED to prevent any unpleasant situations. The Exquimaux Husky never barks. Instead, this dog howls like a wolf, which is why the CED was often mistaken for this wild canine in the past. In fact, the song of howling Eskimo Dogs is one of the most authentic things in the Arctic Circle. To some people this might be an amazing thing to listen to, but others will probably have their blood run cold. The CID can be very vocal at times and is especially prone to howling if bored. So, keep that in mind and try not to ignore your dog if you don’t want to annoy your neighbors. Like it is the case with many other sled dogs, Canadian Huskies are not suitable as watchdogs or guard dogs. This is because they are often friendly with strangers, but can also completely ignore them, depending on the mood. They will extremely rarely confront a stranger, even if his/her intentions are mean. Usually, if the stranger comes at your property, the Canadian Eskimo Dog won’t sound the alarm, neither will he try to protect it. He will just curiously approach that person, check it out briefly (maybe he/she has some food hidden in the pockets :)) and then leave it quietly. So, yeah, if you’re looking primarily for a good watchdog, this is definitely not an ideal breed for you. When it comes to other pets, things tend to be not so peaceful and friendly. The Canadian Eskimo Dog is a very powerful and intimidating dog with superb hunting instincts of a wild predator. The Inuit domesticated these dogs only as a mean of survival in the merciless terrains of the Arctic Circle, and they had treated them harshly, without too much care. So, CEDs were often forced to hunt for their own food. That’s why they possess such strong prey drive, which makes them extremely dangerous for small animals, such as cats, rabbits, guinea pigs, hamsters, birds, etc. In other words, the Kingmik Dog will instantly chase and kill every small animal he spots. Fortunately, this can be corrected in the puppyhood, if you raise your dog with other pets. However, keep in mind that some of these pets (rodents, especially) will always be too tempting for him, doesn’t matter what you do. So, if you already own such pets, it would be wise to choose another, more suitable, dog breed. The CED is also quite bully when it comes to other dogs. He will usually pick a fight with dogs that do not belong to his pack, but will also struggle for dominance in his own pack. That’s why you should definitely raise your CED with another dog, but make sure to keep them in separated crates while you are off home to avoid any trouble. The Canadian Eskimo Dog is without a doubt a highly intelligent dog with extremely good memory. So, it’s quite obvious that he can easily understand, learn and remember even the most demanding commands. However, this is one of those dogs with the will of his own. In other words, he will only obey a certain command if he finds some purpose in it. That’s why it can definitely prove a challenge to get this buddy motivated for the training. So, it is perfectly clear that this is not a recommended dog breed for novice owners. In order to overcome the Canadian Husky‘s stubbornness and independent will, you, as an owner, will need to know how to establish yourself as a pack leader with dominant attitude. You will have to be firm, constant and determined, but never rude, loud or hysteric. Treat your dog with respect, otherwise he will become increasingly shy, timid and disinterested. The best time to start with the training is when the puppy is two months of age. You should train your Canadian Eskimo Dog regularly on a daily basis. Lessons should be short, interesting and fun. Of course, positive reinforcement techniques are recommended when you work with this dog, so make sure you praise and reward him with tasty treats for every lesson learned well. Main Canadian Eskimo Dog characteristics are high intelligence, huge strength, high stamina, agility, endurance, tenacity, independence, stubbornness, alertness, boldness, resourcefulness, toughness, and willingness to work. This is truly a restless and tireless dog with huge energy and great working capacity. The CED can easily be active and busy all day long, which is expected from a hard-working breed of dog such as this. So, it is perfectly clear the Exquimaux Husky requires a large amount of daily exercise (except in warm weather) to stay healthy both mentally and physically. That’s why this dog breed is especially recommended for sporting and outdoorsy people, who prefer activities in nature. The Canadian Inuit Dog should be taken for a long (1 hour minimum) walk, jog or hike at least once a day. However, in most cases that just won’t be enough. You will also have to play some mentally challenging games with him, such as follow the leader, hide-and-seek, find the treat, etc. Or you should keep him busy with some very intensive work or sport, such as bikejoring, carting, skijoring, or backpacking. The key is to keep your Canadian Husky occupied as much as possible, otherwise he might become bored or better to say completely unpredictable. Bored Canadian Eskimo Dog is capable of all sorts of nasty things. He is agile, strong, determined, intelligent, and resourceful, all of which can benefit him greatly in a good way, but can also boost his wild side to another level. When bored, CED can completely destroy your house interior or exterior, or he can run away in a blink of an eye. Indeed, the Canadian Husky is a very curious dog eager to explore his surroundings for himself, which, in other words, means to find some food or to hunt down small animals. So, if there is any way out of the owner’s property, he will use it just to check what’s going on in the neighborhood. The Canadian Eskimo Dog can jump very high, so he can easily scale over a moderate wall. However, he is not only an excellent jumper, but an outstanding digger. He can totally destroy a garden with ease, or he can dig his way out of the courtyard if possible. On top of that, this dog is also a strong chewer, capable to tear the fence with his teeth. So, as you can see, CED is truly a superb escape artist that is literally on an expert level. That’s why you will need at least 6-feet high fencing around your property that is also very firm and placed deep into the ground. The Canadian Inuit Dog is primarily an outdoor dog that enjoys running around in large, open spaces, but that doesn’t mean he cannot be kept indoors. This dog is by nature very clean, has no doggy odor, and is relatively easy to housebreak. However, this could be only possible with the proper amount of exercise and adequate training, which would require a lot of time and sacrifice. So, it is definitely not recommended that you keep your CED in an apartment or a house. The ideal living place for this dog should be a farm or a house with a securely fenced yard located in suburban or countryside area. The yard should be large with lots of green space for him to play and run around freely. It would be nice that you have at least some kind of natural environment close by (forest, river, mountain), so that you can, without too much worry, let your dog off leash while walking him. Speaking of walking, here I have to point out one more thing! The Canadian Eskimo Dog should be only taken for a walk only by a very strong person. Like I already said, this is extremely strong and powerful dog capable of pulling very heavy loads, which is why it is necessary for an owner to be physically strong in order to control this powerhouse. The life expectancy of a Canadian Eskimo Dog is around 12-15 years. It can be said that this is a very healthy breed, but only when it is in its natural habitat. You see, canine diseases, which are common in dogs living in the warmer parts of the world, are unable to exist in the extremely cold environment of the Far North. That’s why Canadian Eskimo Dogs that live in the cold climates of the Arctic Circle are not susceptible to the majority of transmittable diseases and parasites, except distemper, canine hepatitis and rabies. This, of course, doesn’t mean the Canadian Husky is immune to them. No! In fact, he is even more vulnerable than other dogs that are used to warmer conditions. So, if you live in warmer regions and wish to buy this dog, keep in mind that you will have to take all the necessary precautions to prevent any risk of contamination or parasites. Your CED puppy will have to receive all necessary vaccines as well as flea and tick prevention treatments to stay safe. However, there are some other diseases recorded in these dogs you should pay attention to, such as hip dysplasia, cryptorchidism, cataracts, Addison’s disease, and allergies. Luckily, for now there are no known cases of inherited diseases in the breed. The Canadian Eskimo Dog is a large and heavy medium-sized dog of squarish shape – he is a bit longer than tall at the withers (ratio 11:10). CED looks like some cross between the Siberian Husky and the Alaskan Malamute. This dog has very muscular, imposing and strong body, covered with dense and long (3-6 inches) double coat. The undercoat is extremely dense and soft (like cotton-wool) and the topcoat is straight, coarse and hard. The hair is longer on the neck (creating a mane in males), back of the hind legs, stomach, and tail. Although the Canadian Husky is mostly recommended for people in the Northern Hemisphere, he can adapt to all climates. However, you must know this breed is prone to heatstroke in extremely hot weather, which is why you will have to take certain precautions. First of all, you should keep your Qimmiq in a cooled and shaded area during hot days, with lots of cold and fresh water. Also, avoid exercising him during the hottest time of the day. This dog has moderate grooming requirements. Usually, your dog will do well with weekly brushing, but since the CED is a heavy shedder, you will have to brush him once or twice a day when shedding. Although the Canadian Inuit Dog comes in many different colors and shades, the most common are white, gray (silver), black and white, red and white, brown and white, and gray and white dogs. Solid black and solid gray dogs often have white masks on the face. The Canadian Eskimo Dog has a wolf-like, wedge-shaped head with the tapering, medium-length muzzle and massive, broad skull. The rounded nose is usually black, but can be brown or light brown on light colored dogs. The lips are tight and can vary in color from black to light brown (depending on the coat color). The teeth meet in a scissors bite. The jaws are very powerful and strong. The relatively small and almond-shaped eyes are set wide and can vary in color from dark brown to hazel. Even though CEDs can have blue eyes, they are considered false. The erect, thick and triangular ears are quite small, well-furred and pointed forward. You should inspect your dog’s ears and eyes once a month. The neck is relatively short, straight and well muscled. Strong chest is broad and deep, with well sprung ribs. The stomach is just slightly tucked up and the loins are well developed and muscular. The back is straight and strong. The densely haired, long tail is usually carried curled or in the form of a sickle atop the back. The forelegs are straight and very muscular. Because of these strong muscles, they might seem slightly bent. The hind legs are well boned, firm and extremely powerful. The large, rounded feet have arched toes and thick, hard pads, which are protected from freezing by fur between toes. The Canadian Eskimo Dog is truly the embodiment of great strength and endurance, which is more than evident after its powerful, athletic and impressive appearance. I am not afraid of you! The Canadian Eskimo Dog is definitely one of the best sled pulling dogs you can find. For centuries, the Inuit bred and used Qimmiqs for this job, especially, so they have been tried and tested many times in the most extreme situations in the most inhospitable places on Earth. They more than proved their worth as outstanding sled dogs, working also in various missions in the North and South pole. Canadian Husky possesses all the qualities needed for this demanding job – he is unbelievably strong, energetic, hardy, tenacious, agile, very mobile, and eager to work at any given time, under every circumstances. This dog has a reputation of being the strongest of all sled dogs since he can pull incredibly heavy loads up to 80 kg, which is almost twice his weight. The impressive thing is that this dog, with the heaviest load, can cover up to 70 miles a day in the harshest of terrains. Also, Canadian Eskimo Dog can withstand temperatures as cold as -60 °C (-76 °F) or even -70 °C (-94 °F). In the past, these hard-working dogs have been ordinarily used for transportation, freight hauling, and mushing, but due to the increasing popularity of snowmobiles, people lost interest in them as helpers. Today, they are most commonly used in sled dog teams that serve as a tourist attraction. There is no doubt that Canadian Huskies make great sled dogs, but unlike some other similar dog breeds, they’ve also been used for some other purposes. Except for sled pulling, CEDs have been probably most commonly used for hunting, especially of seals, muskoxen and polar bears. They are so enthusiastic about hunting polar bears that the Inuit often shout “nanuq” (“bear” in their language) to make them pull sleds harder. CEDs are typical bay hunting dogs that chase the animal until it is trapped and then hold it at bay until the hunter arrives. It is interesting that, for some reason, they are afraid of wolves and would never pursue’em. Qimmiqs are also often used as backpacking dogs, which is understandable considering how strong they are. On top of that, they can successfully compete in plethora of dog sports, including mushing, bikejoring, skijoring, canicross, and weight pulling, but are not recommended for sled dog racing. All in all, this is truly a wonderful dog for many reasons that will make proud every experienced owner. Unfortunately, the Canadian Eskimo Dog is one of the rarest dog breeds in the world, and is extremely hard to come by even in its native land. However, if you’re looking for a reliable sled dog or just an active and energetic companion that will happily join you in your daily activities, then you should spare no money to get one of these. You certainly won’t regret your decision!